Before, the fight was between the pro-AGW (anthropogenic global warming) camps and those who reject AGW as a scam. Now, the fight is between and among the pro-AGW groups themselves. Particularly, between the environmental NGOs and the World Bank and other multilaterals, of who should handle the multi-billion dollars Green Climate Fund (GCF). No to World Bank Role in the Green Climate Fund! A new global climate fund that will be responsible for managing and disbursing climate finance for the South is vital and has been the subject of climate justice campaigns and of international climate negotiations. 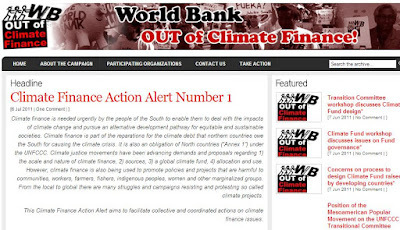 A key demand of climate justice campaigners as well many South countries (“developing countries”) is that the World Bank not be given a role in this new global climate fund given its track record in harmful projects and policies, undemocratic structures and operations, its neoliberal development paradigm, and its involvement in dirty energy. The Transitional Committee had its first meeting last April 28 to 29, and a major issue that sparked debate was the role of the World Bank in the Technical Support Unit (TSU) of the Transitional Committee. A number of developing country members of the TC clearly stated their position that the World Bank not be given an influential role in the TSU and in the regular structures and operations of the Green Climate Fund itself. This position has been strongly articulated by many movements and civil society groups in various statements addressed to the UNFCCC and the Transitional Committee. So if these NGOs dislike the WB to manage the fund, who will? The Asian Development Bank (ADB)? EU/EC? UNEP? UNDP? Other multilateral bodies? 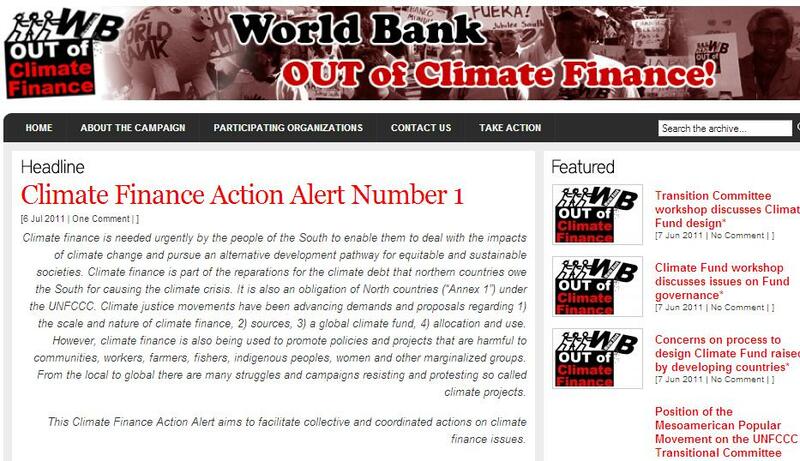 "We urge you to keep the World Bank and other multilateral development banks out of the Green Climate Fund." This means that even the ADB, another institution dispensing billions of dollars of loans for "climate adaptation" and "climate mitigation" of poorer countries, will be disbarred by this big group of environmental and activist NGOs. So, who will handle that huge amount of tax money from rich countries? Greenpeace? The World Wildlife Fund (WWF)? Oxfam? These three big international NGOs are in the frontline of climate alarmism, along with the UN IPCC, FCCC, UNEP, GISS-NASA, Al Gore, among others. I notice that none of them are in the list of the lobbying NGOs. Hmmmm, tens (or hundreds?) of billions of dollars of tax money as "climate finance" to save the poor, save the planet, to be handled by some big international environmental NGOs. I smell a rat. No wonder why they are fighting now. Money-money-money. Tax-tax-tax. The AGW scam must continue. Or many of these guys will be exposed as charlatans and will lose jobs. 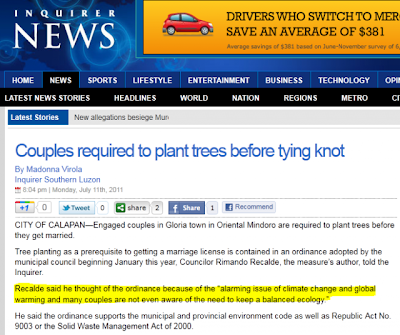 Meanwhile, there's this weird news in Manila today. 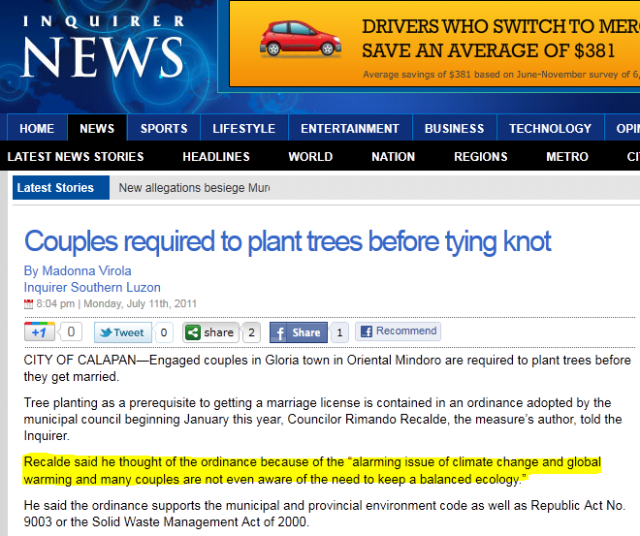 WUWT made fun of this news in its blog article, So, if you get divorced, can you chop them down? From national to local governments, the extent of coercion and regulations keep expanding -- to "save the planet." And those "ice free Arctic" and "ice free Antarctica" fiction-projection repeatedly announced by the alarmists, here's the latest satellite pictures of the polar regions as of two days ago. Sea ice extent as of this week in the Arctic is around 8 million sq.kms. In Antarctica, it's around 14.5 million sq. kms. The lowest sea ice extent that occurs in the Arctic is around 4.4 million sq. kms., happening sometime around mid- or late-September each year. That's the lowest or the "worst" scenario that can happen each year. Just how "small" is 4.4 million sq. kms.? Well, the Philippines' total land area is 0.3 million sq. kms. That's for the whole 7,100+ islands and islets that currently contains 95 million people, the 12th biggest population in the world. So even the "worst" and lowest sea ice record in the Arctic will still be 14.7x larger than the total land area of the Philippines. 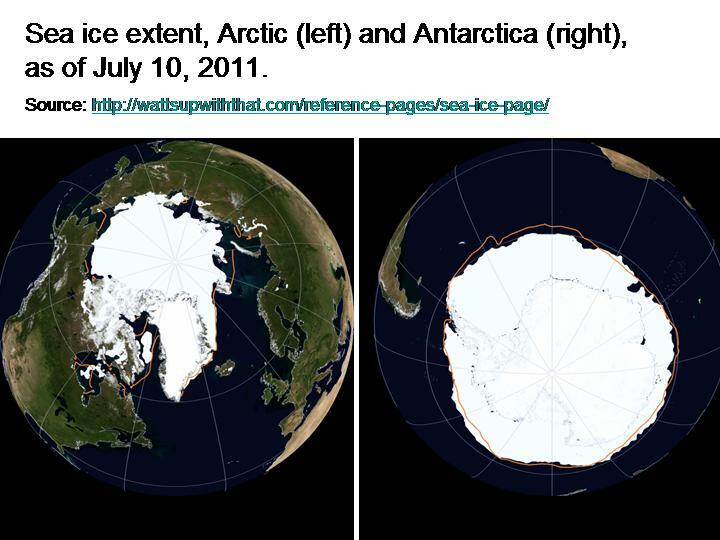 The maximum sea ice extent in the Arctic is around 14.4 million sq. kms., happening sometime in mid-March each year. That's 48x the total land area of the Philippines. So if you listen to the climate alarmists, it's really scary that Arctic will have a totally "ice free" summer in the next few years. The extent of their lies is directly proportional to the amount of money they get -- from governments, the UN, and the public they have fooled for so many years now.